K24 has suffered yet another blow after political affairs reporters Jane Chemutai Goin and Apollo Kamau ditched the Mediamax Network-owned station for Citizen TV. The move leaves the station with virtually no political journalists after Duncan Khaemba, Anders Ihachi and Chris Thairu were shown the door in November 2015 when the media house retrenched about 70 journalists. Khaemba and Thairu were later hired by KTN. Senior news anchor Richard Kagoe, who also used to report on politics and current affairs, also quit to join BBC in August this year. Apart from covering political events, the two also doubled as parliamentary reporters. At Citizen TV, the two are set to bolster its political coverage and also fill the void left by Jacque Maribe, who was banned by High Court judge James Wakiaga from appearing on TV as part of the bail sanctions that saw her released from remand after she was charged alongside her fiancee Joseph Irungu for the murder of business lady Monica Kimani. Goin started her career as a reporter at Capital FM before joining K24. 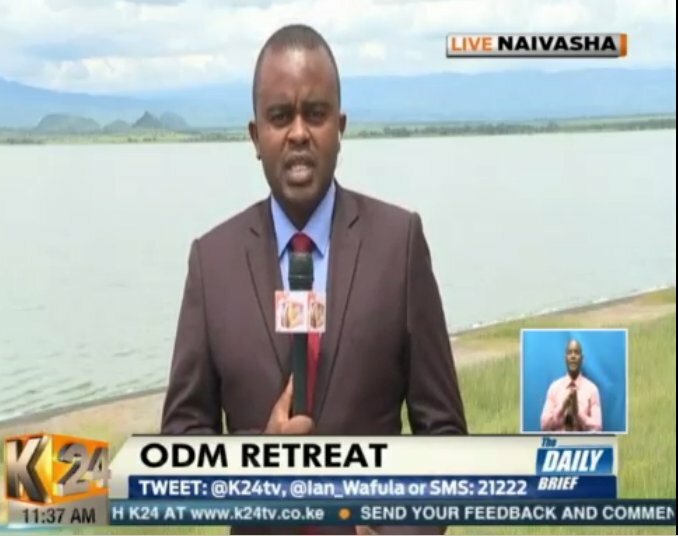 On the other hand, Kamau previously worked with KBC and TBN/Family Media before joining K24 in September 2007 as a current affairs/political reporter. K24 also recently lost rising business reporter Brenda Kerubo. As much as many people in Kenya go to church during the long Easter holiday, quite a number don’t. A good percentage of Kenyans use this opportunity to unwind, meet up with friends and family or go for trips they have been longing for. Kenyan celebrities are no different. Some went to church others took trips within and outside the country while others went on with their businesses as usual. Here is how some of your favourite celebrities celebrated Easter. The C.E.O of Kaka Empire spent his Easter holiday in Dubai with a fan who won herself a trip after attending the rapper’s Eastlando Royalty Album launch last year. King Kaka posted a video of Susan, the winner of the trip on his Instagram page letting his fans know that their dreams are valid. “I keep my promises, last year while launching my 5th album Eastlando Royalty I promised to take one lucky fan to Dubai. @_susan_ndungu bought a regular ticket and won. Thanks to @trippygotours who were the official tour partners for the Album Launch. Dreams to reality. For your information, ilikuwa mara yake ya kwanza kufika airport@, kaka wrote. BBC Africa Business Editor, Larry Madowo enjoyed his Easter holiday with his extended family in France. The Kenyan journalist attended a church service where two of his nephews were baptised and dedicated. The singer went on Safari for Easter. Victoria who was all dressed up in an animal print two-piece posted pictures of her refreshing trip to the Tarangire National Park in Tanzania. She shared videos of the breathtaking view of animals mingling on her Instagram. Kenyan music group H­_art the band celebrated Easter at the coast. The band took advantage of the extremely hot weather and took a road trip down to Sarova White Sands Beach Resort & Spa with friends including popular Lucy singer, Ben Soul. A drunk graduate had to cough up a staggering Sh36000 after forgetting to change her home address on Uber – and ordering a cab more than 300 miles in the wrong direction. Helen Dryden, 25, enjoyed a boozy day out in Shoreditch, east London, with friends and ordered a cab to take her home afterwards. She had hoped it would take her to Guildford, Surrey, but she forgot her Uber home setting was set to her previous address in Newcastle, 303 miles northeast. And the bungling Newcastle University graduate fell asleep in the back of the cab and when she woke up an hour later she was 60 miles north – near Milton Keynes, Buckinghamshire. The driver did a U-turn and eventually took Helen to Guildford, a journey which cost the woman Sh36,000. “I couldn’t believe it. The whole day ended up costing me about Sh52,000,” she said. I ended up getting home at about 4am. “I take responsibility for it because I got too drunk. It’s the first time I’ve ever done something like this. I’m devastated by it. It’s too much money to comprehend.”To add insult to injury, Helen says she still hasn’t paid the bill because the card she paid on has insufficient funds. The payment will be processed on pay day at the end of the month.Incredibly, Helen went out again on Saturday night and ordered an Uber home. President Uhuru Kenyatta on Monday imitated West Pokot Governor John Lunyangapuo‘s remarks where he described a local politician as “Kijana mfupi round“ meaning a short person with a round figure. President Kenyatta met the governor during a visit to former President Daniel Moi‘s Kabarak home to deliver his condolence message following the death of Jonathan Moi. The video shows Uhuru repeating Lonyangapuo’s statement as he gestures to illustrate a protruding belly. The two then burst into laughter and proceed to shake hands. The action provided much needed comic relief to the mourners who had gone to console Mzee Moi. In the governor’s clip that went viral, the Lonyangapuo was clearly agitated by a man who was causing trouble for him. Dennis Ruto, the man believed to have been the target of the joke, explained that at first when he heard the county head’s sentiments, he felt bad. “At first I actually felt bad because that was body shaming that is criminal [sic] . But at the end of the day, I laughed it off,” he told Nation. “I had raised the issue of the deputy governor who had been sworn in and had gone to the United States and why he is earning public funds and not delivering services” Ruto added. Dennis disclosed that he had embraced the name Mulmulwas (something that is round like a ball) and even formed a movement with the same name. Watch the video of Uhuru imitating Governor Lonyngapuo’s remarks below. VIDEO: What killed Jonathan Moi?